Choosing A Marijuana Strain, Pt.3: All About Autoflowering Seeds. This is a great example of the wonders modern cannabis breeders are achieving with cannabis genetics. The “Auto Mazar” from Dutch Passion is an incredible piece of work; an auto-flowering, high yielding, very potent cannabis plant that will go from seed to harvest in 2 1/2 months. Damn. (I should note here that I am in no way affiliated with Dutch Passion). Even with less perfect conditions than those in which they grew that monster plant in the video, you can be sure to harvest enough buds to medicate for a long period of time! I am currently doing the easy “window grow” technique from my new ebook with an autoflowering plant, and will harvest about 20 grams from a plant that I used no additional lighting to grow. Breeders of these strains of cannabis have made tremendous leaps in productivity and quality of the plants in the last few years. They are no longer “something for home growers who don’t mind low quality marijuana” – they are serious seeds for any grower to consider cultivating. The well known Cannabis sativa and C. indica plants are what botanists call “photoperiodic” plants. That is, they require a certain period of sunlight in order to go into flowering. As days become shorter and autumn approaches, most cannabis plants take this as their cue to go into flowering, creating seeds to continue the species the next year. This is a clever development in the plant’s evolution, and is driven by hormones in the plant that are destroyed by sunlight; when the plants only receive 12 hours of light a day (give or take), then not enough of this hormone is broken down by the light, and the plant begins to flower. 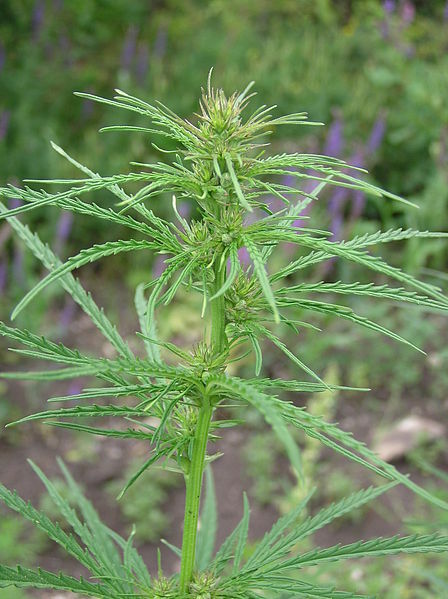 Some researchers figure Cannabis ruderalis to be an “escaped” relative of industrial hemp plants that have adapted to wild living, much as feral pigs regain the boar-like traits of their ancestors. The flowers of C. ruderalis are, like industrial hemp, relatively low in THC and therefore rather uninteresting to the recreational smoker. On the other hand, it’s tough, wild nature brings a new set of traits to the sometimes over-bred cannabis varieties that have been cultivated for many years. These plants are high in CBD (which has numerous medical benefits), often disease- and pest resistant, and – most interesting – begin flowering based on the age of the plant, instead of the length of the day. So it is the humble C. ruderalis that brings the so called “autoflowering” trait to the cannabis breeder’s genetic bag of tricks. Within the plant kingdom, there is nothing unusual about this trait, but it is not typical of Cannabis indica and sativa, which are the preferred varieties for medicinal and recreational consumption. Sativa and indica plants will continue to grow vegetatively until the days become short enough to trigger flowering. This means they may grow for three or four months before they begin flowering. Ruderalis cannabis plants will begin flowering as soon as the plant is just a few weeks old (generally anywhere from 3 to 5 weeks old). This means that a harvest of ruderalis buds could be brought in much sooner in the year, and even many times in one growing season! The thing is, no one really wants to smoke this wild “ditch weed”. Those who have tried it have learned the hard way that the plant is not specialized in producing mild aromatic flowers. Pure ruderalis buds produce a harsh, acrid smoke that is low in THC. Not only does it taste terrible, you’ll have to smoke a lot more of it to feel any effects. Clever cannabis breeders were intrigued with this early flowering trait, regardless of the lousy bud the plant produced. They knew that by cross-pollinating some top-notch bud producers from the sativa and indica strains, they could certainly (with much trial and error) breed a plant with the desirable traits of each. They did it. The famous “Lowryder” strain of cannabis started a mini revolution for home cannabis growers. About 15 years ago, a breeder known as “The Joint Doctor” presented the low-profile “Lowryder” plant: It would grow to be just over a foot tall, produce about 15-20 grams (1/2 ounce+) of bud, and was not a bad smoke. It didn’t have the flavor or potency of the larger growing indica and sativa strains, but was a manageable height, and produced a harvest very quickly. Through further breeding, the Joint Doctor released seeds for more potent and refined strains, such as Lowryder #2, Diesel Ryder, and Easy Ryder. These improved breeds produce a better tasting, more potent smoke. The Autoflowering race was on. In following years, the convenience of these fast growing, low maintenance strains made them popular among home and guerilla growers. Pro growers with access to high-tech indoor grow facilities and legal outdoor cannabis farms tended to look down on the “lowly” autoflowering varieties, preferring their indica and sativa genetics to ruderalis “mutts”. Perhaps the negative attitude towards autoflowering varieties had to do with the threat of easy home growing to the income of professional growers, but I digress. The great thing about cannabis is that the sativa, indica, and ruderalis varieties can interbreed. So by crossing a Lowryder plant with a powerful White Widow strain, you’ll (to put it very simply) get a batch of seeds that produces plants with traits from each parent plant. A few seeds are likely to produce plants with daddy’s’s knack for autoflowering and momma’s incredible THC content! Generation after generation, breeders have selected hybrids from autoflowering and sativa/indica parents with the most desirable traits. This is an ongoing experiment, and the results are getting better all the time. Now, in 2012, the breeding has advanced so far that autoflowering varieties are no longer scrappy-yet-lovable mutts, but serious hybrid strains that can hold their own in potency and flavor against any of the “pure” indica and sativas strains (and the numerous indica/sativa only blends). Although Lowryder and co. are still a great bunch of plants, the newer strains from Dutch Passion, Dinafem, Sensi Seeds, and the Joint Doctor himself have raised the bar. Try growing “Purple Jem”, “Auto Mazar”, “Auto Blueberry”, “White Haze Automatic”, or “Polar Light #2”, and you will be pleasantly surprised at the results. In the next post I’ll give you the skinny on feminized seeds, and why you may or may not want to choose a feminized variety for your next grow. I believe I was very snobbish and regarded autoflowering strains as subpar varieties. Only last year I tried to grow my first autos and was impressed with how little maintenance they require and how fast they grow. I grew two strains: a very nice Pineapple Express by Fast Buds and a much more inferior Tundra #2 by Dutch Passion. It’s true that the smoke wasn’t spectacular in both instances but I’ve had photoperiod strains before with just an OK smoke so I don’t really mind that. Autos are great in their own way!